We get amped for Manchester by the Sea’s 4th of July. Making the trek from Colorado and abroad, hometown friends and family return to celebrate without question the biggest holiday in town. The day begins with the morning parade of old-fashioned cars, marching bands, local floats, reenactors and ends with the awarding of the best, most creative floats. 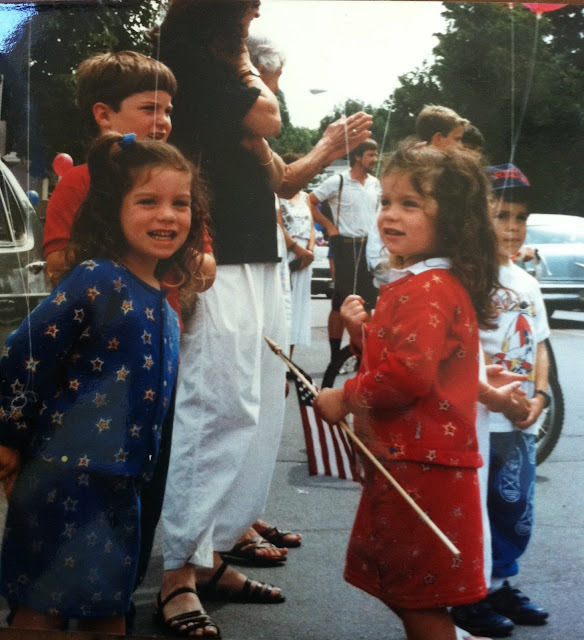 At an early age in matching red and blue outfits, we always looked forward to the candy being thrown from the floats and covered our ears when the old fashioned muskets were shot. In years past we were also active participants in the parade on racquet-adorned trucks for our state champion tennis team or riding bikes covered in ribbon and glitter. After the parade, all-day cookouts ensue with fireworks to follow on the beach. This year, in anticipation of so much red, white and blue, we make a mixed berry cobbler. The blend of juicy blueberries, blackberries and strawberries (or whatever are fresh!) soaked up by buttery balls of dough and topped with a creamy, cool scoop of ice cream is the ultimate All-American dessert. We modernize the classic dish by cooking it atop the grill. Upon removing the grill top, you are faced with a bubbling array of berries that just pop like fireworks. Preheat grill to 350 degrees Fahrenheit. Spread a 9x9 baking pan with 2 T softened butter. In a large bowl, combine the berries, brown sugar, flour, orange zest, orange juice, cinnamon and salt. Pour into the buttered baking dish. In a separate large bowl, combine the flour, granulated sugar, baking powder, and salt . Add the cubes of butter and combine using your fingers until coarse crumbs form. Pour in the buttermilk and vanilla extract. Flour your hands and knead the dough in the bowl until the dough just comes together. Divide the dough into 9 cobbles and drop on top of fruit with a large spoon. Brush biscuits with the 1 T milk and sprinkle with the sugar in the raw. Place the baking pan on the grill and cover (If you do not have a grill, the oven works too) . Cook until the filling is bubbling and a toothpick inserted into the top a golden brown biscuit comes out clean, about 30 minutes. Spoon the warm cobbler into bowls with a heaping dollop of vanilla ice cream and serve. Serves 6-8. The cobbler can be enjoyed throughout the holiday...with a dollop of yogurt on top, it’s also a great pre-parade breakfast!